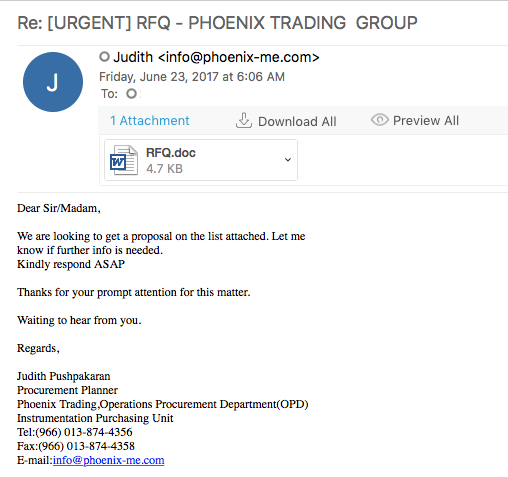 Looking for some malspam yesterday and I came across something that looks like it was exploiting the CVE 2017-0199 vulnerability in MS Office RTF files. FireEye did a nice write-up of this which you can read here. Googling to see if anyone else had seen these domains before, I was able to find that @Security Doggo had a sample back on the 14th of June for the dev[.]null[. ]vg domain and that Sophos has written about the domain toopolex[. ]com domain in their “Troj/Fareit-DEB” report. Running the PCAP through Network Total’s tool, I saw that it is labeling this infection as part of the Loki Bot family. As usual, the malware and artifacts can be found over on my Github here. 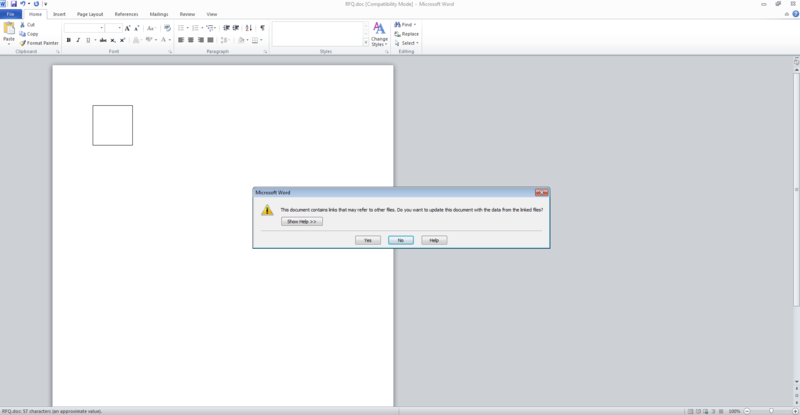 The interesting thing with this file is that it is really a RTF file and not a true Microsoft Word document. When you look at the file via strings, you can see the header for RTF and not a Word document. 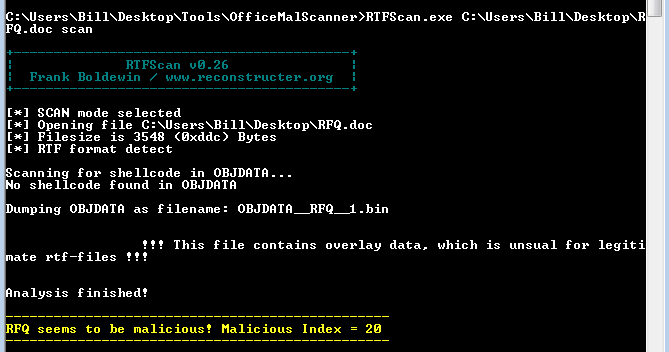 Plus, when trying to run this document through OfficeMalScanner it told me that it had detected the RTF file format and to use RTFScan. When using that tool, I got the following. 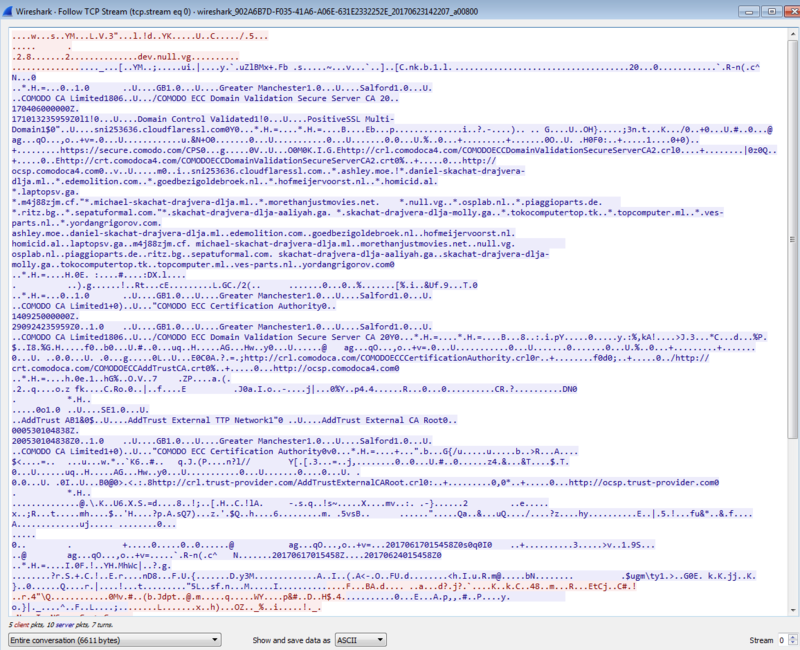 I took a look at this new file via a couple of different tools (strings, and Sublime) but did not see anything much. On a gut-feeling I opened the file in a hex editor to see if there was anything that I was missing. Using the xxd command (xxd RFQ.doc_object_000000B1.raw), I saw another URL. which after the BASE64 block of text is decoded you get the following Powershell script. It looks like it potentially downloads another binary (RFQQ.exe) from the site “hxxps://toopolexlounge[. ]com,” and saves it to the %APPDATA% folder and re-names it vbyu.exe. Looking at Wireshark, the only traffic that I am able to see is when it went to the initial site ‘hxxps://dev[. ]null.vg’ and managed to download the HTA file (the ofVYuVBj.hta file was in the Temporary Internet Files folder). I did not see anything in the APPDATA folder called “vbyu.exe” at that time. which I clicked on “Run.” Once I ran that file, I could see the MSHTA process spin up and then the Powershell process under that. I also saw that a couple of new files/folders were created on my VM, one of them being the “vbyu.exe” file. When looking at the Process Tree via Process Monitor I could easily see the relationships between parent and child processes. Switching to Process Monitor and looking for the “oki.exe” file in the log, I noticed that the “vbyu.exe” process created the various files found under the “bpe” folder. I also noticed that when the two “oki.exe” process spun up, they also called two particular files that were created by the “vbyu.exe” process as a parameter or option perhaps. Looking at the strings of this file (aot-otu) showed a treasure-trove of information. Unfortunately I was not able to determine what it meant or what the code is doing. Further digging into the initial “oki.exe” process (PID 2756) and using the filter option of “CreateFile” under operation (a read operation can happen under the CreateFile operation) in Process Monitor, I can see that this process at least opened and read most, if not all the files in this directory. At this time I am not sure why. The other “RegSvcs.exe” process (PID 1080), I believe, is the *something* that was registered with .Net since this was the process that was communicating via the POSTs found in Wireshark to the malicious site. This malware also maintains persistence via another registry setting found in “HKEY_CURRENT_USER\Software\Microsoft\Windows\CurrentVersion\Run” with the following details: “WindowsUpdate”=”C:\Users\%username%\AppData\Roaming\bpe\oki.exe C:\Users\%username%\AppData\Roaming\bpe\aot-otu” but unfortunately I was not able to determine what process was responsible for creating that registry key. Update 2017-06-24: Thanks to David Ledbetter (@Ledtech3 on Twitter), he was able to find the “missing” process. I am not sure how I missed this one, but the “oki.exe” process was the process that created the “WindowsUpdate” key in “HKEY_CURRENT_USER\Software\Microsoft\Windows\CurrentVersion\Run.” Thanks David! Update 2017-06-26: The stream that talks to the site “hxxps://toopolexlounge[. ]com” mentioned above looks to have two URLs in it (ckav[. ]ru﻿ and youCmake[.]ch[.]ng﻿). When Googling around for information about this malware, I came across the link from Cysinfo that talked about the same URL as well. I ran the application “strings2” against the two “RegSvcs.exe” processes, and created logs for each of them to investigate further. As seen below, there were some hits for applications to look for and obtain credentials from, along with the domain of “hxxp://toopolex[.]com/controllers/user/fre[. ]php” and the user agent as well and perhaps what is sent back to the site. There is a lot of mention around crypto as well in the one RegSvcs.exe process. I have updated the Github repo with these two strings2 output.